"How often is there murmuring in parishes?” he asked, pointing out that whenever “I don’t like the testimony, or there is a person that I don’t like, murmuring immediately breaks out.”". "And in the diocese? The 'intra-diocesan' struggles ... The internal struggles of the dioceses; you know this. And also in politics. And this is bad. When a government is not honest, it tries to dirty the opponents with the murmurings ". 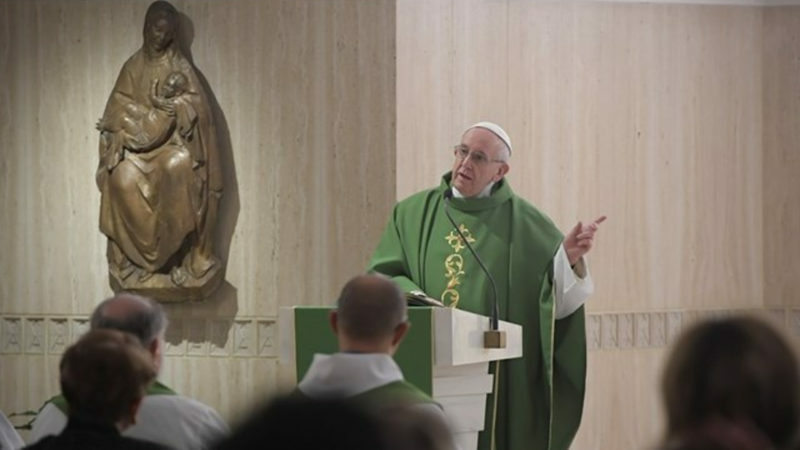 Vatican City (AsiaNews) - The testimony, which makes the Church grow, "always breaks a habit" and also "puts you at risk", provokes the murmuring "not to allow people to think" and does not welcome joy of the Gospel. 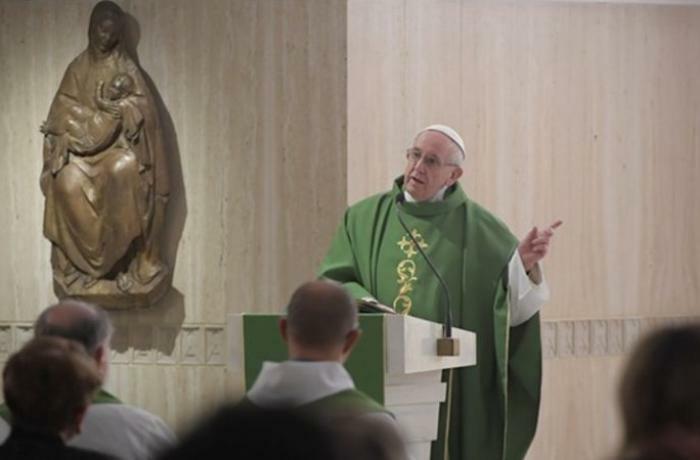 Pope Francis said in the homily of the Mass celebrated this morning at Casa Santa Marta. He was reflecting on the day’s Gospel (Lk 15:1-19), which begins with the witness given by Jesus: tax collectors and sinners approach Him and listen to Him; and He eats with them. Bearing witness is breaking a habit, a way of being… Breaking it for the better, changing it. For this reason, the Church advances through witness. What is attractive [to people] is the witness. Not the words, which help, yes; but witness is what is attractive, and what makes the Church grow. It is a new thing, but not entirely new, because the mercy of God was also there in the Old Testament. They, these doctors of the law, never understood the meaning of the words: ‘I desire mercy and not sacrifice.’ They had read about mercy, but they had not understood what it was. And Jesus, with His way of acting, proclaimed this mercy with His witness. And in dioceses? ‘Infra-diocesan’ conflicts… Internal conflict within the diocese. You know this. And also in politics. And this is bad. When a government is not honest, it seeks to soil its opponents with murmuring. There’s always defamation, slander, always looking for something [to criticize]. And you know dictatorial governments well, because you have experienced it. What makes a dictatorial government? Taking control first of the means of communication with a law, and from there, it begins to murmur, to belittle everyone that is a danger to the government. Murmuring is our daily bread, at the level of persons, of the family, the parish, the diocese, the social level. It’s a matter of finding a way “to not look at reality,” Pope Francis said, “of not allowing people to think.” Jesus knows this, the Pope said, but the Lord is good, and “instead of condemning them for murmuring,” He asks a question. “He uses the method they use.” They ask questions with evil intentions, in order to test Jesus, “to make Him fall”; as, for example, when they asked Him about paying taxes, or about divorce. Jesus asks them, in today’s Gospel, “Which one of you, having a hundred sheep, if he has lost one of them, does not leave the ninety-nine in the wilderness, and go after the one which is lost, until he finds it?” And “the normal thing would be for them to understand”; instead they do the calculation: “I have 99,” so what if one is lost? : ‘We’ll let this one perish, and in the balance it will result in profit and loss, and we will save these.’ This is the logic of the doctors of the law. ‘Which one of you?’ And their choice is the opposite of Jesus’. For this reason, they do not go to speak with sinners, they do not go to the tax collectors, they do not go because ‘it is better not to dirty myself with these people, it is a risk. Let us save ourselves.’ Jesus is smart in asking them this question: He enters into their casuistry, but puts them in a position contrary to what is right. ‘Which one of you?’ And not one of them says, ‘Yes, it’s true,’ but all of them say, ‘No, no, I would not do it.’ And for this reason they are unable to forgive, to be merciful, to receive.